Antique balloon-back chairs were dominantly made between 1850 and 1890. Many finer examples were made as part of a suite and came in sets of four or six. They were intended for use in the salon, rather than as dining chairs, and that makes balloon back carvers exceptionally rare. 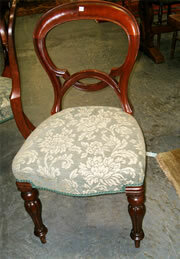 The finest examples will be light and elegant with cabriole front legs and usually made in walnut or rosewood. There are of course larger numbers of mass market produced balloon back chairs that will probably not seem quite so elegant. Until recent years there have been few fakes produced, their modest price and available numbers have kept this at bay, however there are now examples produced in the far east and exported to Europe and the US, though they can be identified by the timber and heavier design. Antique balloon back chairs usually have a degree of carving; the top and uprights are typically made separately and will have a visible but subtle joint. A set of 4 excellent quality early victorian mahogany balloon back chairs with stuffover seats and turned legs. This is a regular design so it can be matched quite easily. An excellent quality set of six Victorian mahogany balloon back chairs with fluted legs stuffover seats and well carved backs. 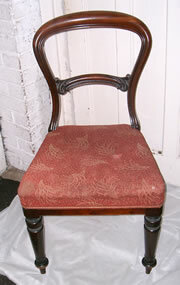 Both the wood and upholstery are in very good condition. 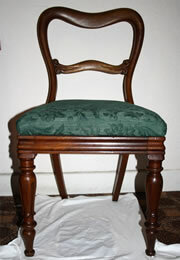 Wanted: Victorian Mahogany balloon back chair, as shown. 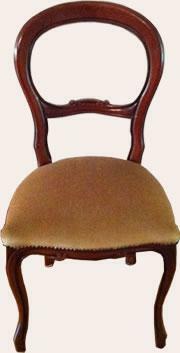 Victorian Mahogany balloon-back chair, as shown. 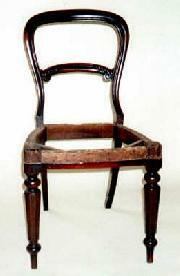 For Sale: An early Victorian Balloon back dining chair, in Mahogany with a carved rail. An early Victorian Balloon back dining chair, in Mahogany with a carved rail.